WE'RE BUILDING A TEAM OF FORWARD THINKING PROFESSIONALS WHO ARE ON THE CUTTING EDGE OF THAT TREND. BUILD YOUR CAREER WITH THE TEAM THAT IS CHANGING IT ALL. NextHome Realty Marketing is one team oriented, with passionate members, who care about each other with compassion and loyalty. We are one team that is encouraging and supportive. We are committed to our clients. We pursue excellence through continuous improvement and effective, efficient execution. We are accountable for decisions we make. We are responsive and collaborate to achieve the best result. We communicate honestly creating an open, transparent and trust-based environment. We inspire creativity and innovation with passion and energy. We respect and appreciate the perspectives of others. We care about the growth and development of our people, our clients, and our community. We all lead by example every day. We are a technology-driven office that understands and knows that each agent needs are different and we are adaptable to the agents. We have office space available or you can work from home office. You will have access to client information and be able to perform all tasks and functions from any place using our complete mobile technology systems. 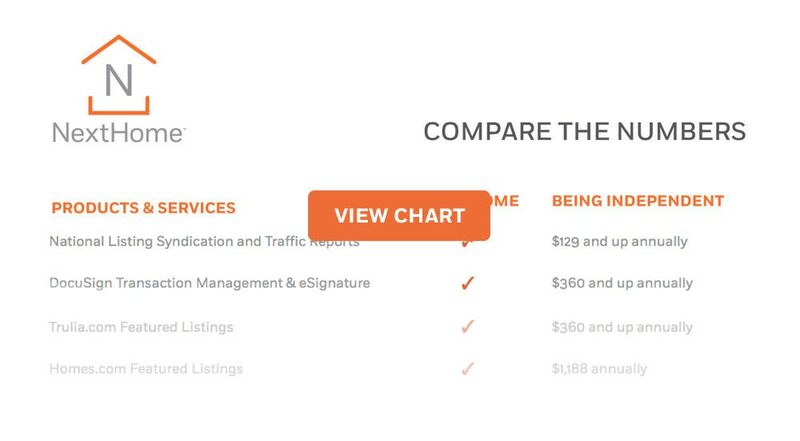 Our better commission splits, along with superior computer systems, no royalty and no service fees, no FMLS transaction fee, vendor selections, and other services are all designed to substantially drive down the costs for agents to pursue their careers. You do not have to pay us to join our firm. The majority of leads are generated straight from your Marketing and Featured Listings program, so these leads are free and exclusively yours. We are about providing quality leads, not quantity or time-consuming leads. On-demand, web-based and live training on our programs and services. Communicate directly with a live NextHome corporate support staff person that is focused on responding promptly and accurately to your questions. Or, ask your broker! Being a virtual brokerage, without expensive brick and mortar edifice, you don’t have to contribute to maintain an expensive desk that sits there 24/7, whether it is used or not. Our Agent Fee Structure is as simple as you can get. We offer a zero fee structure. There are no surprises. No extra fees, period. Our Agent Fee Structure is as simple as you can get. We offer two models: a monthly flat rate fee, or a percentage of the firm’s commission for the transaction. In either case, there are no surprises. NextHome Realty Marketing offers agents the option to change plans every six months. Why change plans? One common reason is seasonal. During the slower winter season, our agents can choose the percentage option. Then, when the spring market arrives, our agents can switch to the flat rate option. An inside look at the NextHome difference. We share how our model is all-inclusive, and show you the products, services, tools, technology and more that will give you the edge to grow local market share. Each office is independently owned and operated. Servicing North Georgia.